I used to believe that stretching was a useless part of exercise. 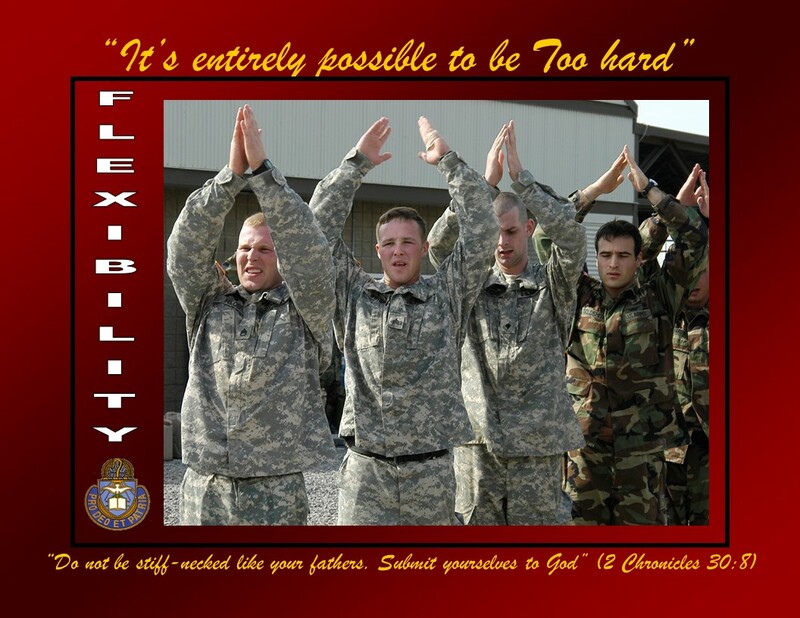 As an enlisted man at Fort Drum in the mid 1990s, I only stretched because our Sergeants made us. In my mind, it wasn’t exercise if it didn’t make me stronger or faster. After all, if I can’t feel my muscles growing or it doesn’t help me lose any weight, it can‟t be all that important, right? But in the past few years, injuries and the aging process have begun to teach me that I don’t have the option not to stretch. When I was commissioned as an officer in 1998, I initially thought one of the perks was having a little more freedom to do PT on my own. In fact, in my first six years as a Chaplain I was assigned to smaller posts in Virginia and Germany where the staff officers were almost always on the honor system to do PT on their own, so I rarely stretched. But then we moved to Fort Campbell, and my physical training changed dramatically. Divisions are like humongous versions of the human body: they need their parts to act powerfully and precisely to do anything the “Head‟ calls them to do ASAP. That’s a good working definition for flexibility: being able to turn on a dime, especially in the face of danger. If your body suddenly Photo courtesy of U.S. Army encounters danger and is not flexible, the parts of your body could easily be injured. And, as you can imagine, greater danger and less flexibility increases the risks. But I was “stiffnecked” and didn’t want to turn from my preferred routines. My experience at PT with the 101st was mixed. I loved the upper-body workouts. Because of my longtime focus on my chest and arms, I could take whatever my XO dished out. But when it was a run day, I woke up with a knot in my stomach. I knew he would run us one of two ways: way long and moderately fast or just fairly long and crazy fast! I’d like to say that he was just unreasonable, but the truth is that I was just unprepared. I had been inflexible (or, to use Scripture’s description, “stiff-necked‟) in what I liked to do. Looking back, it’s no surprise that I sprained my ankle twice and turned my knee once in the first months running at Campbell. I began re-evaluating my opinion of warming up after I stepped into a pothole on a 5-mile run. Suddenly, the ground disappeared beneath me and – since I tend to run on the outside of my feet – all of my weight came down on the outside of my ankle. Problem! I had never conditioned my legs to respond to sudden changes with flexibility. Warming my muscles to be more pliable was never a priority with me, but it is now. Life is full of sudden demands. We must be ready at a moment’s notice to respond wherever our Head calls His Body to turn. This is especially true where spiritual danger is involved. And, since every human being is a spiritual person with a natural “stiff-neck‟ toward going their own way, I submit to you that there is always spiritual danger in you and around you (1 Peter 5:8). Ask yourself, “how dangerous is the situation, and in what direction should I turn quickly: prayer? Scripture? Fellowship? I had never really thought of Scripture‟s warning against being “stiff-necked‟ until I began to study the parallels between physical and spiritual life. Flexibility is crucial, isn‟t it? that takes over your body. Simply doing more of what we’re already doing is like walking faster and stomping harder in the same circle. That just creates a deeper rut! To truly grow, we need to do something different. This is why the most successful workout plans involve muscle confusion: always keeping your body slightly surprised. Repentance is an “About Face!” – a 180 degree turn from self-focus to Christ-focus and His ways. This requires “flexibility‟. How might you become more aware and meditate on flexibility? Team with other believers for opportunities to confess my need, invite them to the same goal, and support each other. If you’d like a free download of the 8″ x 10″ picture at the top of this article for printing and framing, you can click here. You can receive more posts like this by subscribing to tools4trenches.